Scroll down to find current ski condos for sale throughout the Upper Valley and enjoy easy access to some of New Hampshire and Vermont’s top ski areas. Find a variety of condos with wonderful amenities, such as beautiful mountain views, private terraces, tennis courts, walking trails, and playground areas. Life in Quechee is just right living in this modern and spacious condo. A short walk or golf cart ride will put you on one of the two beautiful golf courses or step outside to the backyard and play tennis or stroll over to the pool. This condo, with its amenities and location, has it all. The main level is perfect for entertaining with a sunken living room, spacious dining room, and modern kitchen with granite countertops and newer appliances. 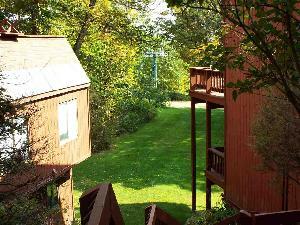 The master is also on the main level with access to the deck where you can spend summer nights enjoying the Vermont air. Upstairs there are two well laid out bedrooms and a full bath. The lower level is a bonus with a living/sleeping area and a full bathroom. Massive storage area with laundry and room to further expand the finished living space. A must see condo in a highly desirable area of Quechee! Check out the 3D walkthrough by clicking "virtual tour" in the property details. Immaculate end unit condo in a four-unit building at the very top of Sugar Hill with long range views to the southeast. It has three bedrooms and two baths. The main floor has a well equipped kitchen, dining area that opens into the living space, one bedroom and a bath. The second floor has the other two bedrooms and bath. It is comfortable and only a three minute drive or long walk to Simon Pearce and "downtown" Quechee attractions and the town green, and a five minute drive to Quechee Club clubhouse. Being offered mostly furnished with a few exceptions. Click on the "Unbranded Tour URL 1" below to view a 3D Virtual Tour of the condo. This is a very unique Parkhurst style condo. There is a view to the Eastman Lake cove from the wrap around deck, level entry and walking distance to two beaches. Located very near the Eastman north entrance, this makes commuting easy and convenient. The first floor has a large fireplace living room, a dining area, kitchen, laundry room 1/2 bath, master BR with private bath and walk in closet. This is where things change, the 2nd floor has a loft and a 2nd master BR. If you want a king sized BR you have found it!! A walk in closet and a full bath with double sinks and a beautiful view to the cove from the large windows. The basement is partially finished but basically wide open for you to finish. This unit also has propane fired hot water baseboard heat which is a real bonus. Eastman is a 4-season community that offers something for everyone. There is a 345 acres lake with 6 beaches, championship golf, tennis, hiking, biking, indoor pool and fitness center. There is something for everyone of any age. You can be as active as you want or just come and relax.